A chance for local businesses to partner up with area schools by purchasing season tickets which in turn are donated to local schools. Schools can use these tickets to reward students that excel in academics, athletics, and extra curricular endeavors. Tickets can also be used by school committees as a means for fundraising. How does your business become a Corporate Ambassador? As a corporate ambassador/sponsor, your business would buy into the program and your tickets will be donated through the team on your behalf. Schools will be chosen based on criteria. We are able to facilitate special requests. Why should your business become a Corporate Ambassador? 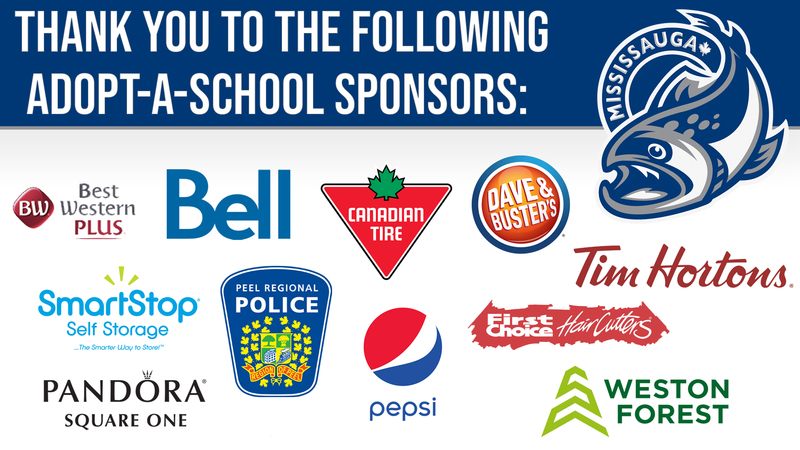 The Mississauga Steelheads would like to extend a HUGE thank-you to our following Adopt-a-School sponsors. Thanks to your support more than 30 schools in the Mississauga and Peel Region have been adopted by local businesses in our community.